I never enjoyed the classic Scooby Doo cartoon shows. Even as a child, I found them repetitive and formulaic. 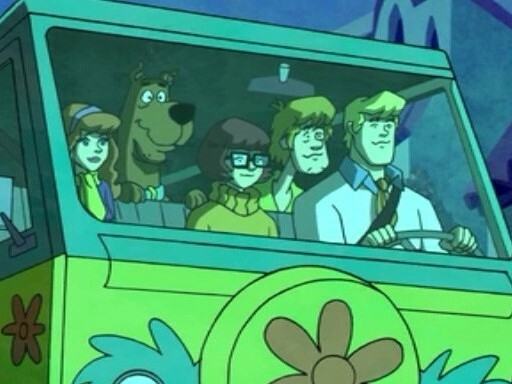 In every episode Fred, Daphne, Velma, Shaggy, and Scooby Doo would drive into some spooky town in the Mystery Machine and get chased by a scary-looking creature for a while before accidentally gaining the upper hand and unmasking the fiend. The animation wasn’t all that impressive, nor were the characters. So there was absolutely nothing for me to enjoy about the show… except for the catchy theme songs they always managed to have at the start of the show’s various incarnations. Seriously, check these out. They’re amazing. Imagine my surprise when I discovered a little show called Scooby Doo! Mystery Incorporated (2010-2013) as I was looking for something interesting to watch with my kids on Netflix. From the first 10 seconds of the first episode, I was hooked. It was so different than what I was expecting. The show actually has a flowing narrative that is complex and rewarding to untangle. The characters are suddenly interesting, and they have evolving personas and relationships. There are betrayals, tragedies, and redemptions. And – I can’t stress this enough – this is Scooby Doo! The cartoon I found insufferable as a kid has matured into an incredible piece of art. I worried my kids would find it too scary at times, but they love it almost as much as I do. So let’s test our mettle as we uncover the mystery of what makes Scooby Doo! Mystery Incorporated such a pleasant surprise. Stephen King’s It – for Kids! Stephen King’s It is one of my favorite books, and it was even turned into a solid TV movie in 1990. For years I’ve heard talk of it being turned into a big-screen film or a longer TV miniseries, but little did I suspect that I would find it told in beautiful fashion in a Scooby Doo cartoon series. Seriously, this two-season show has a lot in common with It. A group of kids work together to fight a malevolent force living beneath their hometown. Their parents try to separate them for good, but they eventually come back together to engage in a final fight against an ancient evil. Their town has a history of unexplained mysteries that repeats in cycles. The kids’ unity and friendship is what wins the day. The evil force destroys their hometown. Most people lose all of their memories relating to the horrors they survived. The story of Scooby Doo! Mystery Incorporated unfolds little by little, and it does so in a way that constantly keeps you guessing. There’s a lot going on below the surface. As you learn more about the town’s history and the characters’ checkered past, you get an urge to go back and re-watch earlier episodes to get a new perspective. As I mentioned before, the five main characters in the original series were static and boring. But in Scooby Doo! Mystery Incorporated they suddenly have memorable character traits and interesting relationships. Fred isn’t just the leader of the group; he’s obsessed with traps. Daphne can’t help loving him, but despite her best efforts he remains completely oblivious to her hints that she wants to be his girlfriend and (eventually) his wife. Watching them interact is always hilarious because they’re so right for each other and yet so disconnected. Shaggy and Scooby Doo love each other. Their friendship is one of the highlights of the show because they’re deeply loyal to one another. Velma has feelings for Shaggy, but every time he’s forced to choose between his love for Velma and his friendship with Scooby Doo, he chooses man’s best friend. No contest. It’s a testament to the power of these characters that we keep wanting to see them overcome their personal foibles and work together as a group to solve each episode’s mystery. And what’s even better is that we get to see what happened to the previous generation’s Mystery Incorporated. They become the bad guys of the series who are using our heroes for their own ends. But even they wind up having inner conflicts that prevent most of them from going full evil. At critical moments they sacrifice their own lives for those meddling kids. I never thought I would say this, but I now love Fred, Daphne, Velma, Shaggy, and Scooby Doo. I want them all to be happy, and seeing them overcome their differences and overcome ultimate evil thanks to their love for one another is one of the most gratifying viewing experiences I’ve ever had. The incredible Frank Welker has voiced Fred just about every time the character has shown up in animated form, starting all the way back in 1969. He has such a unique voice, I can’t imagine anyone else attempting to impersonate him. He must have had so much fun playing Fred completely straight while also being in on the joke of the direction this show takes with his character’s stoicism. The actors who provide the voices for Shaggy and Hot Dog Water are also experienced pros. They appeared in the two early-2000s live-action Scooby Doo films as Shaggy and Velma, respectively. Patrick Warburton (Kronk in The Emperor’s New Groove and many other great characters in film and TV) plays a memorable recurring role as the local sheriff. He’s always funny, and he even gets a few episodes dedicated to his quirky character. This is even crazier when you consider that as Brock Samson in a particularly memorable (and demented) episode of The Venture Bros. he killed Fred and Shaggy. Maurice LaMarche has played more cartoon characters than you’d believe. He voiced Destro and Serpentor in the old G.I. Joe TV series and he voiced the Brain of Pinky and the Brain. 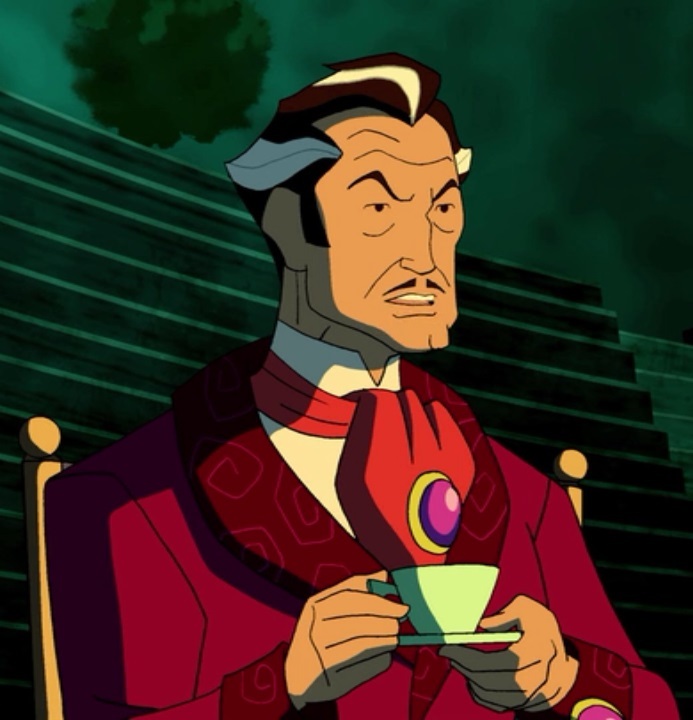 In Scooby Doo, he does a phenomenal job bringing to life Vincent Van Ghoul, a glorious parody of Vincent Price. Casey Kasem, in his final role before his death, played Shaggy’s soft-spoken dad in a few episodes. This is a clever callback to the original series when he did the voice of Scooby Doo. And there are too many others to name. Watch this show and you’ll be amazed not only by the gorgeous animation but the familiar voices that keep popping up. Scooby Doo! 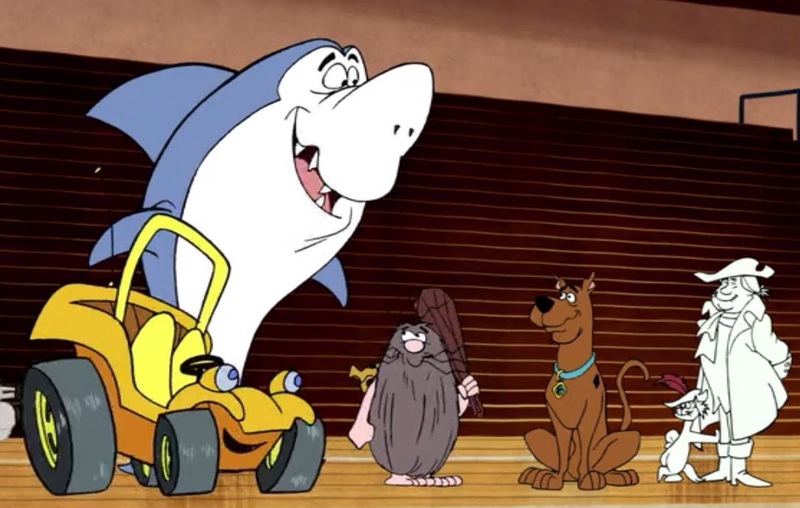 Mystery Incorporated is such a clever show. It’s constantly referencing old Hanna-Barbera cartoons, scary movies, and other bits of pop culture. 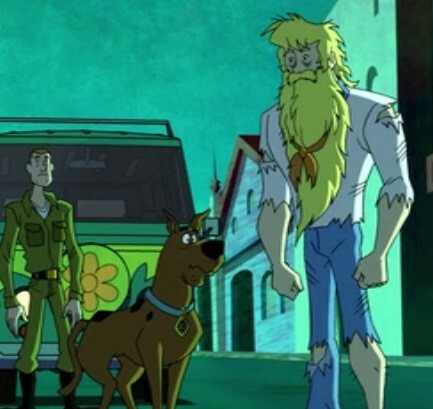 One of my favorite episodes is the one where Scooby Doo has a dream in which he and the gang look like their old 1969 selves and they run into all sorts of classic cartoon characters, like the Funky Phantom, Speed Buggy, and the awesome Captain Caveman. The funny thing is that that episode has one of the weaker mysteries of the series, but it’s just so much fun seeing all of those characters interacting that I could forgive anything. I don’t know if it’s intentional, but the musical theme that plays at the end of most episodes when the kids are explaining they mystery sounds an awful lot like the main title theme of Dune (1984). I would ordinarily laugh this off as a coincidence, but the final episode of the series begins with an obvious Dune reference with a minor female dog character staring straight at the audience and describing the state of things, just like Virginia Madsen does at the start of Dune. Scooby Doo! 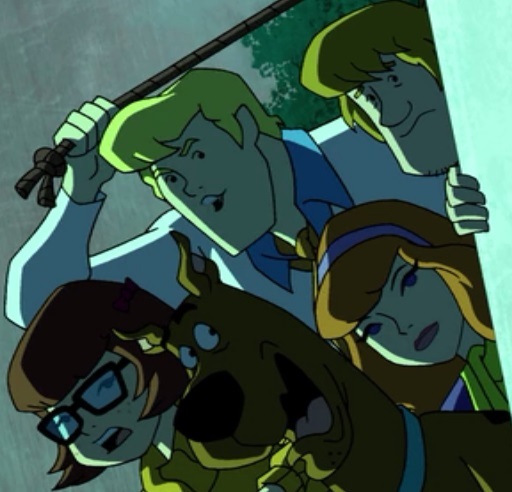 Mystery Incorporated is a masterpiece. The only thing I don’t like about it is that it ended. Its ending is so satisfying. It lets the audience have our cake and eat it, too, because we get to see the end of the world and the start of a new, better one. And it ends with the kids starting off on a new adventure where they’re going to drive across the country solving mysteries in every town along the way. What a brilliant way to tie this series back in with the original! They’re doing exactly what they started out doing. Except this time it’s purposeful and not repetitive. I love this show. If you ever notice it on Netflix or on DVD and you wonder if it’s worth your time to watch, I say: Scooby Dooby do! This entry was posted in Pleasant Surprises and tagged cartoon, comedy, fun, funny, humor, jokes, mystery, nostalgia, parody, relationships, romance, scooby doo, TV shows. Bookmark the permalink.